The Grand Theatre (now Broadway Boulevard nightclub) is situated on Mostyn Broadway, between Llandudno's town centre and the suburb of Craig Y Don. It opened on Monday, August 5th 1901 under the direction of Mr Milton Bode, one of the best known managers in the theatre world. 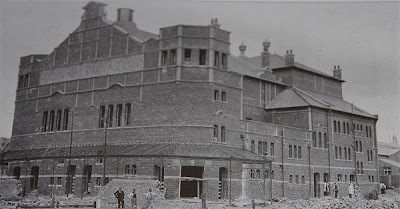 The architect was George Humphries of Mostyn Estates, with renowned theatre architect Edwin Sachs as consultant. Built with a red brick façade topped by low semi-octagonal towers, the theatre seated 1,000, with two well curved balconies with eight rows of seats each and two boxes at either side of the first balcony and one box above. The boxes are divided by slim colonettes. A segmental arch with lattice decoration spans the auditorium above while the saucer dome ceiling has a plaster sunburst around a central rose. Plaster work on the proscenium, boxes and balcony fronts is of scrolls, festoons and musical instruments. The Grand Theatre was primarily a play house, but musical comedies were also part of the staple diet. In the late 1920's, the theatre was fitted with a British Accoustic sound system and films were screened for several years, complementing the stage productions. 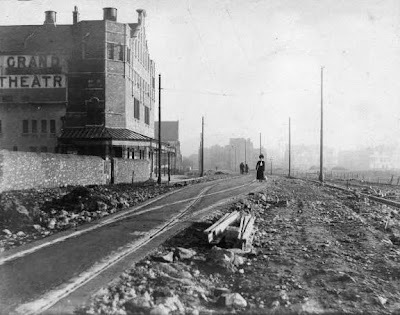 Grand Theatre in the early years - note remote location! The Grand Theatre closed as a theatre in 1980, and was reopened as the Grand Revivals nightclub in the late 1980s. 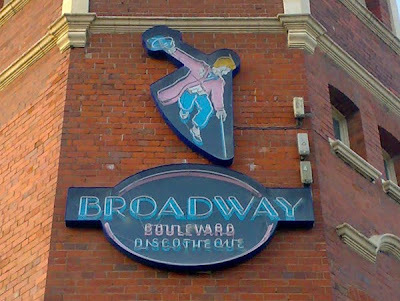 It remains open as the Broadway Boulevard nightclub today, with large parts of the upper building being unchanged from its theatre days. More details and photos to be added to this article soon!